Amish With A Twist I BOM Quilt - Queen or King! Programs - Most Include Backing! > Amish With A Twist I BOM Quilt - Queen or King! 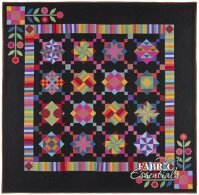 Amish With A Twist I - Flexible Block-of-the-Month Quilt (BOM) Program! Two Sizes + You Pick Your Background and Backing Colors! 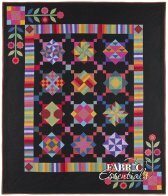 Fabric Essentials offers an exclusive KING size version of this popular quilt! NOTE: Call us at 785-243-4044 if you want King. Right now we have Queen sizes cut, but we may be able to cut the King Extension Kit if fabric is available. 88 3/8" x 105 1/2"
105 1/2" x 105 1/2"
A NEW Twist! More background color choices! 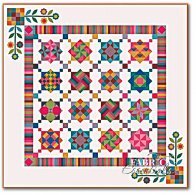 Inspired by classic Amish quilts, Amish With A Twist is a set of lessons designed especially for the beginning quilter. The colors and finish of the cotton were carefully planned for an authentically Amish effect. 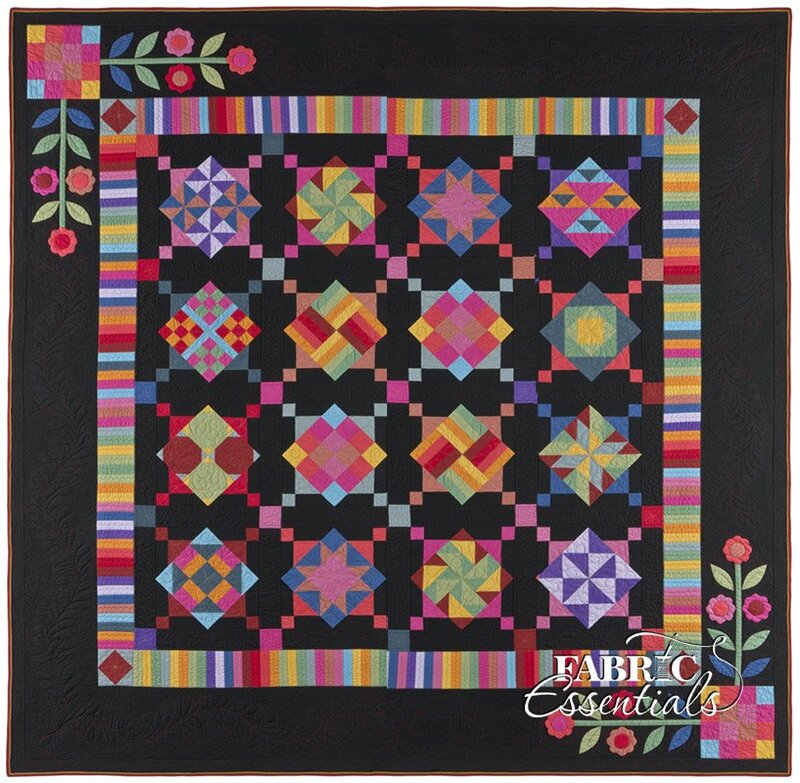 This 15-part workshop approach focuses on the basics, with twelve lessons on the basic shapes common to quilting and three finishing lessons that include making the block "frames," adding the appliquÃƒÂ© on the corners, and completing the sashing, borders, and binding. Note: Some lessons have more fabric than others. For lesson numbers 3, 6, 9, 12, and 14, you will receive the pattern only as the fabric has already been included with previous lessons. * All fabrics for the top, binding, and borders. This totals 15 1/2 yards fabric! * 8 Yards for Backing (you choose the color)! * Boo-Boo bundle of Fat 8ths so you don't have to worry if you make a mistake! * 9 3/4 Yards for Backing (you choose the color)! Backing is included in your program and you can choose any of the Marcus Centennial solids or a fun dot! Here's a link to our entire Centennial Solids collection. Some people prefer multiple colors on the back. We can also send three different colors and you can have three large strips or cut them up and mix them up! When we receive your order, we will call you to discuss how you would like the program to work for you. We cut blocks ahead, so you can work ahead! You are not limited to just one block per month! We encourage you to group your shipments to save on shipping and handling. We can generally send three blocks for the same price as one block, and you save! This is why we offer flexible BOM programs. You can choose how many lessons (blocks) to get and how often to get them! Many people buy 3 blocks every month. Others do 3-6 blocks and then call us when they are ready for more. This is YOUR program. We will work with you to tailor it to your life and your budget. Shipping and handling is not included in the above monthly program costs, and will vary by month because of weight. In all cases, we try to send shipments in the most economical way possible. The pattern recommends using Piping with the binding. The Groovin' Piping Tool helps trim a small piping's seam allowance with an accurate 1/4in or 1/2in seam allowance very quickly. The tool is 11.5in in length and is designed to work with 28, 45, or 60mm rotary cutters. Detailed 16 page booklet teaches quilters to make and apply perfect piping. Note: 12 yards of piping cord are included with your BOM program. Choose the size project you wish to make (Queen or King) and reserve your space now. Your non-refundable Reservation fee is applied to your BOM total (you actually get something for it!). * You can choose one or more blocks per month to fit your time and budget! Don't forget all the extras you get with this program! Cutting diagrams, 8 Yards Backing, 12 Yards Piping Cord, and a Boo-Boo Bundle of Fat 8ths! Cutting diagrams, 9 3/4 Yards Backing, 12 Yards Piping Cord, a Boo-Boo Bundle of Fat 8ths, and a King Extension Kit! We offer Fat Quarter Bundles of the 17 fabrics used in the project (see dropdown menu below) as well as yardage of the entire Marcus Centennial collection. See all colors here. What Happens After I place my Reservation Fee? We will call you to discuss how you would like the program to work for you! We'll want to find out which background color you prefer. We cut our kits ahead so you can work ahead, and many people like to save money on shipping by by grouping their kits. We are very flexible and want to know what you prefer. We'll then set you up on our autoship program according to your preferences (which can be changed at any time)! Call us at +1-785-243-4044 or email us at fabricessentials@aol.com. Finished Quilt Size 88 3/8" x 105 1/2"
Sew a pieced Four-Patch block made in Lesson #2 to one end of each 75"-long applique border. NOTE: If you have already cut your borders 65" long, cut two 10 1/2" squares from the Black fabric and sew a square to each of the 65"-long borders on the end opposite the applique.